In the first module of the Ending Extinction: The Basics San Diego Zoo Global Academy course, participants are given a good foundation for understanding what extinction is, and the natural history of extinctions that have taken place over time. The newly available Ending Extinction: The Basics—Module 2 takes a look at the definition and process of modern-day extinction, including extirpation and functional extinction in the wild. This course examines background extinction rates vs. current extinction rates, and why many scientists think our planet is now in the midst of a sixth mass extinction of animals and plants. Traits that make some species more vulnerable than others are discussed, as well a variety of reasons the pace of extinction has accelerated—including human influences like habitat destruction, exploitation of animals and plants, pollution, and disease. Course participants will learn how the International Union for Conservation of Nature (IUCN) Red List identifies and monitors the status of threatened and endangered species; and a video case study highlights the current crisis facing giraffes, and what conservation measures are needed to keep them from going extinct. As people are becoming concerned about preventing extinction, they are developing new conservation strategies and enhancing existing ones that protect endangered species and their habitats. Ending Extinction: The Basics—Module 2 explores these strategies and programs. The social, environmental, ethical, and business reasons for protecting Earth's biodiversity are examined, along with a review of state, federal, and international regulations that work to protect animals and plants. As leaders in the protection of endangered species, the role that AZA-accredited zoos play in preventing extinction, both in natural habitat (ex situ) and under managed care (in situ) is also discussed, including contributions to conservation field projects, species recovery, veterinary care for wildlife disease issues, genetics and reproductive technology expertise, the establishment of assurance populations, and public education. The course wraps up by discussing how ending extinction is everybody's responsibility—identifying conservation action steps that each of us can take at home, while shopping, and at our workplace to preserve biodiversity—and concludes with some of the specific programs San Diego Zoo Global is involved in, including a video case study about recent work to try to save the northern white rhino. With Ending Extinction: The Basics—Module 2, participants will learn the full scope of what extinction means in our modern world and discover what is being done to combat it. They will also find a number of ideas to share with colleagues, zoo and aquarium visitors, and supporters who want to join in the fight to end extinction—ways that we can all make a difference for wildlife. For a sample of Ending Extinction: The Basics—Module 2, click here. For more information on the new Conservation course series, please contact Gary Priest at gpriest@sandiegozoo.org. Adult and Child CPR is designed to teach participants how to properly perform adult and child CPR. Participants will learn important definitions, hazards, and symptoms to look out for, as well as the proper way to perform the Heimlich maneuver. 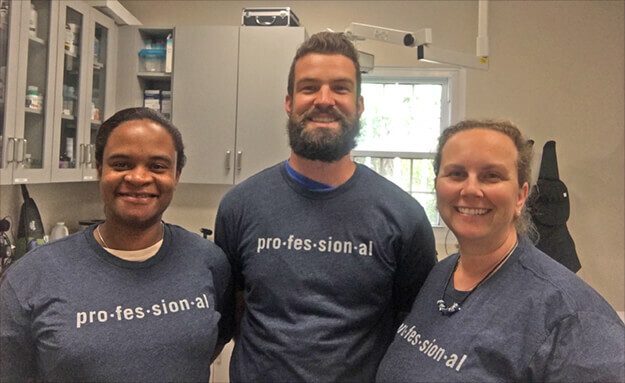 Academy Users Seen Wearing Academy T-Shirts! The husbandry staff at the Bermuda Aquarium Museum and Zoo (BAMZ) shows off their Academy spirit. Pictured from left are Tricha Cross, head zookeeper; Chris Davis, zookeeper; and Roma Hayward, animal care and quarantine officer. The Dolphin Research Center in Grassy Key, Florida, is part of the Academy's collaborative learning environment. Welcome! Please join us for the Administrator's Users Group Webinar hosted by Academy partner, CypherWorx. The next webinar is Wednesday, April 20, 2016, at 11 a.m. PDT. To register for the Webinar: click here. After registering, you will receive a confirmation email containing information about joining the webinar. The public consciousness about animals has changed dramatically, and continues to evolve. People are increasingly connected with animals in their homes and with their families. Likewise, there is heightened awareness of the unique characteristics of other animals, especially those very visible species inhabiting the zoological world. These and other factors enlarge human compassion for the very animals entrusted to our care. (The good efforts of the zoological community itself have contributed to this shift.) Clearly demonstrating the well-being of the resident animals addresses public concerns about the animals. Openly committing to continuously improving ourselves and our service to the animals upholds the public trust. Excellence Beyond Compliance® explicitly makes continuously improving animal welfare (and, at the same time, AWA compliance) a zoological organization's guiding priority. This commits us to "Getting Better All the Time." As the zoological community depends on public support for its continued existence, this is, at once, the right thing to do and the path forward. Join us to learn more about animal welfare and the Animal Welfare Act, when the Ask Animal Care series continues on Thursday, May 19, 2016 at 3 p.m. EST, with special guests USDA APHIS Animal Care Regional Directors Elizabeth Goldentyer, DVM, and Robert M. Gibbens, DVM; Associate Deputy Administrator Dr. Andrea Morgan; and new Deputy Administrator Bernadette Juarez. Submit your questions and have them answered by the experts. Register now to participate, get further details, and submit any questions and suggest topics for AWA In-Depth: info@excellencebeyondcompliance.com. Registration and submission of questions deadline is Monday, May 2, 2016. © 2016 James F. Gesualdi, P.C. The opinions expressed herein are solely those of the author. This is not, nor should it be construed as, legal advice. By Dr. Rob Jones, "The Aquarium Vet"
Temperature is the main factor that alters the amount of oxygen that a body of water can hold. Cold water holds more oxygen because at lower temperatures the H2O molecules are moving more slowly, allowing more oxygen molecules (O2) to dissolve in the spaces between. In hot water, the H2O molecules are moving very rapidly, and so there is less space available (between the molecules) for the oxygen molecules to dissolve. Hence, at sea level, freshwater with dissolved oxygen (DO) of 100 percent (saturation level) contains less oxygen (in milligrams per liter) at 25 degrees Celsius or (77 degrees Fahrenheit) than it does at 15 degrees Celsius or (59 degrees Fahrenheit). At 25 degrees Celsius, water at 100 percent DO contains 8.3 milligrams per liter (mg/L) of oxygen, while at 15 degrees Celsius, 100 percent DO is 10.1 mg/L oxygen. The table below shows this more clearly. Table showing the amount of Dissolved Oxygen (DO) in mg/L (100 percent saturation) at various temperatures (Celsius and Fahrenheit) at zero salinity (freshwater) and at sea level. To extend this further, water at 15 degrees Celsius and 100 percent saturation will contain 10.1 mg/L oxygen. If there is only 50 percent saturation, then the water will only hold 5.05 mg/L, which is below the critical 6 mg/L level. A compounding factor, as previously discussed, is that fish are poikilothermic, and a 5-degree Celsius or (41-degree Fahrenheit) increase in water temperature will cause a 50 percent increase in metabolic rate, which will cause a 50 percent increase in oxygen uptake by the fish. Thus, at higher water temperatures with lower DO levels, the fish require more oxygen. This is the main reason that it is usually warmwater fish that experience low oxygen issues. Barometric air pressure relates to height above sea level (altitude). Altitude has a lesser effect on the level of dissolved oxygen in water than changes in temperature. Increased altitude decreases the oxygen-holding capacity of water. This is because as one ascends, the air pressure decreases and there is a less of a "push" for oxygen to dissolve in water. Barometric pressure can be a factor at high-altitude lakes, although usually, the cooler temperatures of these lakes partly compensates for the reduced oxygen effect of the altitude. Increased salinity decreases the amount of oxygen that water can hold. This is simply because all the ions that are in seawater reduce the area that the oxygen molecules can occupy in the water. As a general guide, at the same temperature and at sea level (barometric pressure = 760mmHg) seawater will hold about 20 percent less oxygen than freshwater. Next month, we will look at other water quality parameters. For more information about the SDZGA discount, or to view our Trial Version, please contact katrina@theaquariumvet.com.au. 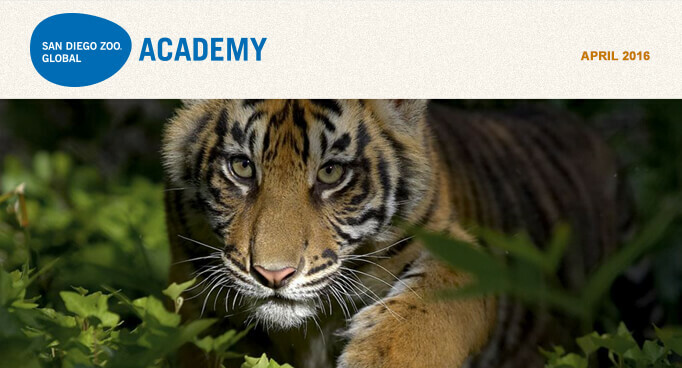 As an added Academy benefit, to view the latest San Diego Zoo Global Zoo and Conservation News, please click here.